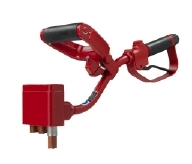 The CP 0006 & CP 0066 scabblers are ideal tools for cleaning and roughening concrete and construction joints. They can also be used to produce ornamental or contrasting finishes on road and building structures. With their different handle designs, CP 0006 is more suitable when working on large surface areas whereas the CP 0066 is mainly used for hard-to-reach areas.